The Splendid Knotted Fan Coral is a rarity in the aquarium industry, and a hard to keep beauty! The Splendid Knotted Fan Coral Melithaea splendens (previously Acabaria splendens) is an attractive beauty. In the wild, it inhabits reef crests, current swept slopes, and calm open water; but lives along the shaded areas or under overhangs and in dimly lit caves. It is very colorful! The attraction of this sea fan is the deep red or deep orange color of their rind contrasted with white or light yellow polyps. They also have fascinating twists and turns in their branches. The Melithaea genus are arborescent colonial soft corals in the family Melithaeidae. Several genera in this family have a dichotomous structure, which is a random "Y" shaped branch pattern that form fan, bush, or tree shapes. The Melithaea species are commonly referred to as Gorgonian Sea Fan, or just Sea Fan, and Fan Coral. The family is characterized by contrasting disks or knobs at the joints of the branches, called "internodes," which are often swollen. These knobs are composed of sclerites like those found in other soft corals, as well as a protein substance called gorgonin which allows for more movement, giving some flex to the gorgonians. Species like the Splendid Knotted Fan Coral M. splendens are only roughly fan shaped. However others, like the Red Reef Crest Gorgonian Acabaria biserialis. branch across one plane creating a fan-shaped colony. The Splendid Knotted Fan Coral is known by a number of common names including as the Pacific Sea Fan, Knotted Fan Coral, and Red Gorgonian. Until 2013, it was scientifically described as Acabaria splendens, so has been known as the Acabaria Fan Coral and Acabaria Sea Fan as well. The Melithaea genus, along with the entire Melithaeidae family for that matter, are notoriously difficult to keep alive in captivity. They are aposymbiotic which means they do not carry zooxanthellae, so they must be fed regularly. They need a constant supply of planktonic foods, which can foul the water quickly. They are easily overgrown by algae, so a dim area of the tank is needed to keep them healthy. These corals are best kept by highly advanced aquarists who have had success with other gorgonians and are willing to devote the time and resources needed for its survival. The Splendid Knotted Fan Coral Melithaea splendens (syn: Acabaria splendens) was described by Thomson and McQueen in 1908. 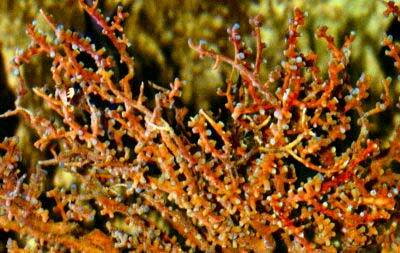 Some other common names this species is known by include Pacific Sea Fan, Knotted Fan Coral, and Red Gorgonian. Until 2013, It was scientifically described as Acabaria splendens, so has also been known as the Acabaria Fan Coral and Acabaria Sea Fan. The Melithaea genus was described by Milne Edwards in 1857. These are arborescent colonial soft corals in the Class Anthozoa, Subclass Octocorallia, Order Alcyonacea, and Suborder Scleraxonia. The Melithaea genus is further placed in the Melithaeidae family, and then under the Subfamily, Melithaeinae. There are currently at least 113 accepted species in the Melithaea genus, though this may change with future research. The Acabaria genus was described by Gray in 1870 and contained over 46 species, but they are now included in the Melithaea genus. Common names they are known by are Gorgonian Sea Fan, or just Sea Fan, and Fan Coral. They are not on the IUCN Red List for Endangered Species and it is unknown if they have been propagated in captivity. The various members of the family Melithaeidae have puzzled ichthyologists for 100 years! The initial genus was Melithaea, and then several others were added on. Based on the internal skeletal structure of sclerites, and sometimes simply by geographic origin, five genera were traditionally identified as Acabaria, Clathraria, Melithaea, Mopsella, and Wrightella, with a six, Asperaxis, being added as recently as 2006. There has been ongoing debate about the validity and status of these genera. Extensive investigations showed much variation in their sclerite morphology, obscuring genetic borders and creating taxonomic uncertainties. Based on the findings of a study In 2013, the taxonomic places for the species in the Melithaeidae family were reviewed and reassessed. From the study of their molecular and morphological data it was determined that many species were not accurately placed. Thus most species, including the Splendid Knotted Fan Coral. have been reverted back to the oldest genus name, Melithaea. There is still some debate, but for now you will see Acabaria splendens shown under the accepted name of Melithaea splendens. Interestingly, the newest genus, Asperaxis, is so different from the rest of the members in the family it is now listed under a new subfamily name, Asperaxinae (Alderslade, 2006). The Splendid Knotted Fan Coral is found in the Red Sea, whereas other members of the genus can be found in the Red Sea, Indo-Pacific, Indian Ocean, and the Maldives. Some from the Melithaea genus have been found in Australian waters from 33 to 82 feet in depth (10 to 25 m), but others can be found as deep as 164 feet (50 m). This family of gorgonians habitat includes reef crests, current swept slopes, and calm open water. They live along the shaded areas or under overhangs and in dimly lit caves. They feed on small planktonic animals that rush up from deeper waters, carried by currents. What is interesting about these gorgonians is sort a conundrum for aquarists. The deep ocean waters provide abundant planktonic food; nutrient rich waters welling up from lower depths, which cannot be duplicated in aquariums very well. This environment would quickly foul the water in most captive environments causing algae growth and low water quality. The ocean, with the aid of lower light, also utilities its very strong water movement to create a constant sort of “brushing” action, preventing micro algae and cyanobacteria from smothering these gorgonians to death. The Splendid Knotted Fan Coral can be violet red or a red to orange color with white or light yellow polyps. Although it is considered a fan coral, the Splendid Knotted Fan Coral is only roughly fan shaped. The pattern can be quite gnarled looking as their branches tend to go in all different directions. It has a dichotomous structure, which is a random "Y" shaped branch pattern. Like all members of its family, Melithaeidae, these gorgonians are characterized by contrasting disks or knobs between the branches called "internodes." It is thought these knobs give them a "hinging" flexibility, preventing them from easily breaking. Their axial skeleton, or central core, is calcium based like other octocorals. The central core is then covered with a protein substance or "rind" called gorgonin. They have sclerites that are fused, or mostly fused, in the axis, the rind, and sometimes in their polyps. The polyps raise out of this rind and are the main way these gorgonians gets nutrition. The absolute size of the Splendid Knotted Fan Corals is unknown. Many similar species reach 13.77 to 14.75 inches (35 - 40 cm), but some can grow as large as 27.55 to 30.37 inches (70 - 100 cm). One site claims this species can reach from between 4.72 inches (12 cm) up to as large as 59 inches (150 cm). (Source: reeflex.net, an interactive online encyclopedia for marine life worldwide). Their life span in the wild is unknown, but they usually only live from only a few months up to about a year in captivity. Size of organism - inches: - Absolute size is unknown. Lifespan: 1 years - Life span in the wild is unknown, a few months to a year in captivity. The Melithaea genus, including the Splendid Knotted Fan Coral, are difficult to care for and have a poor record of survival in captivity. Due to their heavy dietary needs, they are best kept by advanced to expert aquarists. Their aquarium requirements also require diligent attention as they also need a low light level and enough water flow to avoid having algae grow on them. Their need for daily feeding may necessitate a set up of a continuous planktonic drip. This system can be costly and tends to foul the water. The addition of these high nutrients, though easily handled in the ocean, will quickly cause growths of micro algae or cyanobacteria in captivity. These can quickly cover and smother the gorgonian. Lightly “brushing” the Splendid Knotted Fan Coral's rind often will help, along with a moderate to strong water flow and very low light. Anchor gorgonians firmly into the substrate to prevent them from whipping around the tank. See Care of Non-Photosynthetic Gorgonians. In the wild this genus will capture planktonic organisms and microscopic food particles from the water column that well up within nutrient rich waters in the ocean. Unlike other Octocorals, the Splendid Knotted Fan Coral does not contain the marine algae, zooxanthellae, so the need to take in food from the water column is very important to its survival. In captivity the Splendid Knotted Fan Coral does not need light, since it has no zooxanthellae to make use of it. Because of this, they need to be fed planktonic type animals/food daily to survive. Provide feedings of Marine Snow, PhytoPlan, and other micro-plankton foods including, live baby brine shrimp, frozen thawed foods broken up into very small pieces, like copepods and other foods eaten by filter feeding corals and invertebrates. A continuous drip of live planktonic animals is expensive, yet can vital to their survival. Diet Type: Carnivore - Nutrition is obtained by capturing food particles from the water column. Meaty Food: All of Diet - Zooplankton they capture from the water column. Feeding Frequency: Several feedings per day - Continuous plankton drip recommended. Stable tank conditions are needed to keep the Splendid Knotted Sea Fan and other members of the Melithaea genus. Water changes of 15% biweekly or 30% a month is needed, although it is suggested that doing 10% water changes once a week will replenish many of the needed additives and help keep water conditions high. With higher concentrations of coral with calcareous skeletons, there is a need to put in additional additives to maintain proper levels for good growth. Iodine, calcium, strontium, and other trace elements can be added. Phosphates should be maintained as close to zero as possible. The Splendid Knotted Fan Coral needs a tank that is at least 50 gallons to provide room for growth. A mature tank (well over a year old) is advised to increase the successful life span of Melithaea corals. A typical live rock/reef environment, along with some fish for organic matter production, is needed for it to thrive. Provide proper lighting and water movement. Any substrate is acceptable but rocks are needed. Construct areas with the rock work to form overhangs to place them under. They must be anchored firmly in the substrate, as a moderate to strong and turbulent water flow is needed to help avoid algae and cyanobacteria from growing on them. The Splendid Knotted Fan Coral also only needs a dim light source to do well, which makes it best suited for a coral environment that is species specific. These Octocorals are very peaceful but may be at risk of being overgrown by other gorgonians, so adequate space should be provided between the different species. Minimum Tank Size: 50 gal (189 L) - A 50 gallon tank or larger that's matured at least one year. Lighting Needs: Low - subdued lighting - Dim lighting is needed for the Splendid Knotted Fan Coral to thrive. Water Movement: Moderate - Need moderate to strong and turbulent water movement. The Splendid Knotted Fan Coral and other Melithaea species are very peaceful and pose no threat to any other corals or gorgonians. They get along with their own genus, but other gorgonians may over take the peaceful Melithaea corals, so they will need to be kept at a distance. Their low light need is not conducive to survival of many other corals. This gorgonian should be kept with other "no/low light" corals that need constant feeding and a good water flow. Interestingly, these corals are one of several types of gorgonians that can be hosts to the Denise's Pygmy Seahorse Hippocampus denise, which is a species of pygmy seahorse. Anemones: Monitor - Light levels are mostly too low for anemones. Anemones will sting them if given the chance. Mushroom Anemones - Corallimorphs: Monitor - Light levels are mostly too low for mushroom corals. Corallimorphs should be kept away from the gorgonian as they will sting them. Leather Corals: Monitor - Light levels are mostly too low for these corals. Otherwise, keep coral away from this delicate gorgonian. Zoanthids - Button Polyps, Sea Mats: Monitor - Light levels are mostly too low for these corals. Otherwise, keep coral away from this delicate gorgonian. Clams, Scallops, Oysters: Monitor - Only scallops and oysters and some clams that do not need light will survive. Nudibranch, Sea Slugs: Monitor - Avoid predatory species. Stony Corals: May be aggressive - Light levels are mostly too low for these corals. Otherwise, keep coral away from this delicate gorgonian. Soft Corals: May be aggressive - Light levels are mostly too low for these corals. Otherwise, keep coral away from this delicate gorgonian. The Splendid Knotted Fan Coral can reproduce by breakage, fragmentation. The may also spawn like other gorgonians for sexual reproduction. When ready to spawn the many gorgonians will release mature gametes into their digestive system, which is then released up and out through the mouth. After this spawning method, the zygote will develop into planktonic larvae or free floating in open waters. They will form tentacles, septa and a pharynx right before they settle into the reef with the mouth pointing upward. It is possible they have been propagated in captivity, however, it is yet unknown if any of the Melithaea genus has been propagated successful. While propagation is not common since these corals do not live long in captivity, the basic guidelines are using severing or clean cuts. Tearing the coral will result in infection. Be cautious with the use of glues, as many gorgonians react badly to the chemicals. However an underwater epoxy has been suggested by some. Containment is recommended if the frag survives. This involves keeping the frag in one spot, say a small piece of upright pvc, around the same height as the frag, with sand or rubble at the bottom. This will keep the frag from blowing over before it can take root. It is suggested to drill holes in the pvc to keep the water flowing. The Splendid Knotted Fan Coral, as well as the entire Melithaea genus, is very susceptible to algae and cyanobacteria accumulating on its branches, which can smother the gorgonian. If they are exposed to light, which will not harm or help them, they can also get red band and black band infections that are also caused by cyanobacteria. Keeping a stronger water flow and gently regularly “brushing” their rind will help prevent this. If your gorgonian does get this, you can at times cut off the bad part and hope the rest will recover. Freshwater dips can also kill cyanobacteria, and are an effective treatment. They must also be fed on a regular and ongoing basis or will not survive in the aquarium. The second highest mortality for the Melithaea genus is starvation. They may have open polyps but can slowly starve over the next 12 to 18 months. Melithaea species may also be a food source for Flamingo Tongue Snails Cyphoma spp. and snails from the the Murex genus. The Splendid Knotted Fan Coral is very rare in the aquarium hobby, and not readily available at pet shops and on line.